Nutrilon Toddler Milk has the same important nutrients as Nutrilon Toddler Milk, sit but it is better adapted to the habit of quickly growing toddler. Content: 800 grams. Nutrilon Toddler Milk has the same important nutrients as Nutrilon Toddler Milk, sit but it is better adapted to the habit of quickly growing toddler. Nutrilon Toddler Milk 5 is a special milk for babies from 2-3 years. 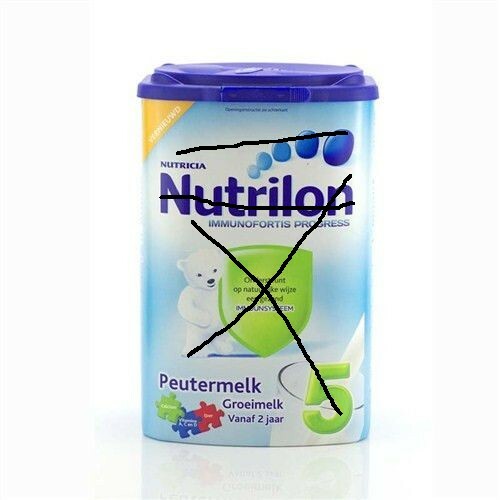 After Nutrilon Toddler Milk 4 is Nutrilon Toddler Milk 5. This milk contains the same vitamins and minerals, but is better suited to the needs of your growing toddler. It contains no less than 28 important nutrients and naturally supports the immune system. Nutrilon contains vitamins A, C and D that support a normal functioning of the immune system. ATTENTION: it may be that the pack Nutrilon is scratched (see picture 3). These are ORIGINAL Nutrilon packages, but the package is scratched to make it less interesting for the sale to traders/whole sale. If you DO NOT want this scratched pack, please do NOT order. Scratched packages are not defined as a visible defect or shortcoming as described in our General Terms and Conditions.